Sneak Peek: Does EQ Solve Workplace Challenges? Since 2006, the Workplace Issues Report tracks changing views of the challenges people face at work — and how EQ is seen as part of the solution. One finding in this year’s report shows: Participants see “people issues” as 75% more significant than their technical/financial issues. So, there is a huge need for emotional intelligence, yet only 28% say EQ development is a high or very high priority in their organization. Want to know more about that 28%? Take the survey and you’ll receive the report — but hurry, the survey closes Feb 8, 2012. 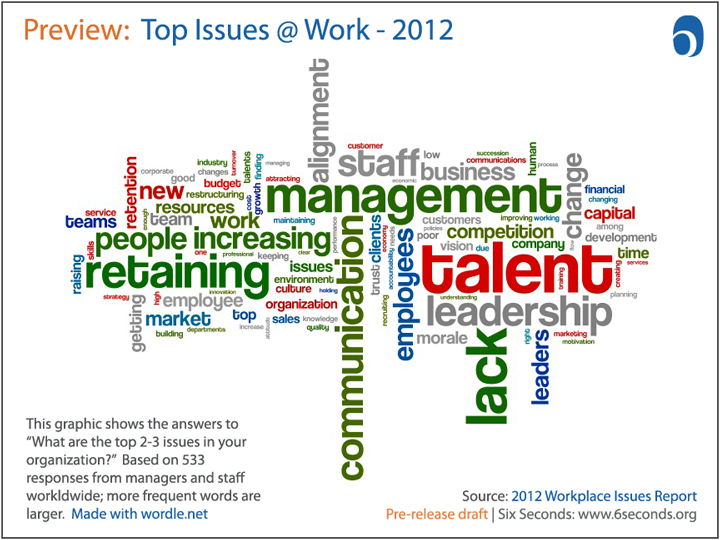 Below is a preliminary summary of the top issues participants identified in their workplaces. Do you agree? Disagree? Take 5 and let us know! http://eq.org/lime/index.php?sid=94151&lang=en . In addition to adding your voice to this important topic, you’ll get a copy of the report — and a chance to win a prize! So true. Lack of communication seems to be a hugh problem. That’s when assumptions are made (you must know the joke about that).in the workforce. Hi Denise & Gagan – let’s go one step deeper on communication: Why don’t people in your organization communicate more? Do they not know how? Not value it? Not trust? Not see people as a priority? Not ____ ? I agree also. I see communication as a continous improvement process at all levels of the organization ( and in one’s personal life). Making it a part of the goals of the organization at all levels can help to remove some of the existing challenges the organization faces. I agree with Anna, Communication should be represented as a larger part of the problem; I will also venture to add a company commitment to utilising across the board resources – empowerment of bottom to top communications solves many EQ workplace challenge. Management can certainly be a primary barrier to EQ however an inherent company policy of workplace learning across the board can alleviate management blocking effective EQ..
(1) communication IS a big concern, probably partly because it’s a “catchall” for a big range of issues from low trust to lack of connection to overstress. PS. I hope you both take the survey and put “communication” as a top issue — and the others you identify Teri! I fully agree with the other participants that workplace problems and challenges revolve around people. I think part of the challenge is the dismal failure to deal and manage emotions, anger management, lack of confidence, fear of failure and fear of the unknown. Thus emotional intelligence has a significant role to play in terms of addressing “people problems” in the workplace. Emotional Intelligence is at the moment, at the bottom of the workplace priority list. Thanks Sphamandla – why is that? Because the value is not clear enough? Yes, Joshua, I believe that is the case. In today’s environment of economic slowdown, emotional intelligence/people-related issues have taken a backseat in many organizations. These organizations (and mine is one of them) are giving much higher priority to top-line growth by expanding sales teams or looking at new products/target markets. Inadequate/inappropriate communication, leading to misalignment of organizational and personal goals, is fueling employee dissent and stress levels, thus somewhat crippling project execution capabilities. What the leadership of these companies are forgetting is that simple acts of encouragement can go a long way in motivating employees, to boost labor productivity and improve output quality, which may actually, in turn, trigger revenue growth and margin expansion. Hi Aditya – so what did you put on the survey as your top issue (if you don’t mind sharing)? Sounds like the real issue you’re seeing is about leaders don’t understand how to engage and motivate the employees because they are too caught up in the “urgency” of increasing sales? I am sure many people related to this issue. I feel communication to be key as well, but I also see the speed at which the change in technology is changing the work force. The demands to over or out perform competitors accelerate stress and emotion. I once had a VP tell me” they wouldn’t hire employees under thirty because they didn’t want to babysit or be a therapist”. Not to say that lacking emotional intelligence is seen predominately in the younger work force, the idea of change for the mature worker can send them on an emotional roller coaster. Emotional intelligence can certainly help to balance any company. Thanks Lee – I think the point is that there are a LOT of added stressors right now (and maybe for a long time to come) and so companies must build that into strategy if they’re going to compete. Hi Elias – in other words, unless we work by ourselves in isolation, we need to know how to work with people — and that’s a central responsibility for everyone on the job – yah? Yes i also believe that communication is the key for the success of any workplace – exchange of ideas with an open mind can bring lots of positive change – we should never forget that a person who is lower in hierarchy at a workplace can also have brilliant ideas to solve the problem at hand. I’m struck by the “importance” of three words in this wordle, management, leadership and communication. I’m disappointed at the relative importance ratio of management to leadership. Our “default” position of communication, top down, stifles the real potential of employees to create the new solutions to old problems. If only we could stand the world on it’s head and realize the higher up we go in the food chain of industry or education, the greater is the obligation to serve. Then the communication would sound more like dialogue, and LISTENING would be prominent in our next wordle.